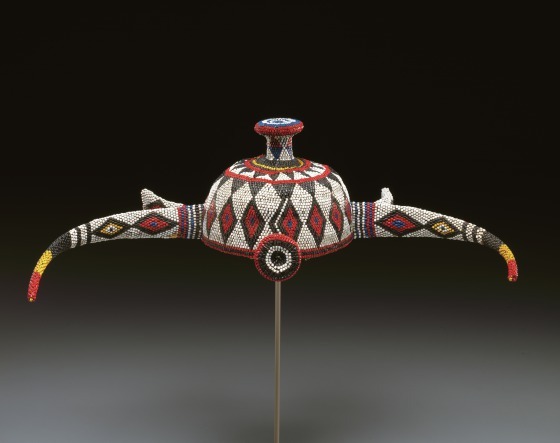 This hat was originally part of the regalia worn by a Yaka or a Suku regional chief (mfumu misala) or overlord, who is the second highest-ranking political leader. The form and materials of Yaka and Suku beaded hats resulted from the complex political relationships that existed between the ancient Lunda empire and the peoples they conquered (upon whom they imposed their political structures and leadership symbols) and from contact with Europe. Around 1940 Yaka chiefs began wearing a beaded pillbox-style hat they purchased from their eastern neighbors, the Pende, who were also Lunda conquests. Chiefly regalia among the Pende included beaded hats borrowed from the Lunda, among which was one with two hornlike appendages that both the Yaka and Suku appropriated. The hornlike projections probably represent buffalo horns. Buffalo are the largest African bovine; their horns in particular symbolized their strength and bulk. The Yaka incorporated an important element from their indigenous leadership regalia into the borrowed hat: a pompom of white feathers that ordinarily surmounted a miniature cone-shaped basketry hat. The colors of the feathers on the misango mayaka varied to indicate the wearer's rank—for example, that of a paramount, regional, or other chief. The colored glass beads used to decorate the hats probably came from the Czech Republic (formerly Czechoslovakia), which has been exporting beads to Africa since the early 20th century when the bead trade was associated with the latex industry in the former Belgian Congo. Roslyn A. Walker, The Arts of Africa at the Dallas Museum of Art (New Haven and London: Yale University Press, 2009), 280-281.